This article contains the wiring connection diagram for XP-SNET. Connect the controller's power terminal to the power supply. Then configure the uplink (to communicate with the software) and downlink (to communicate with the reader) connection. Follow the wiring connection diagram to connect the other terminal correctly. 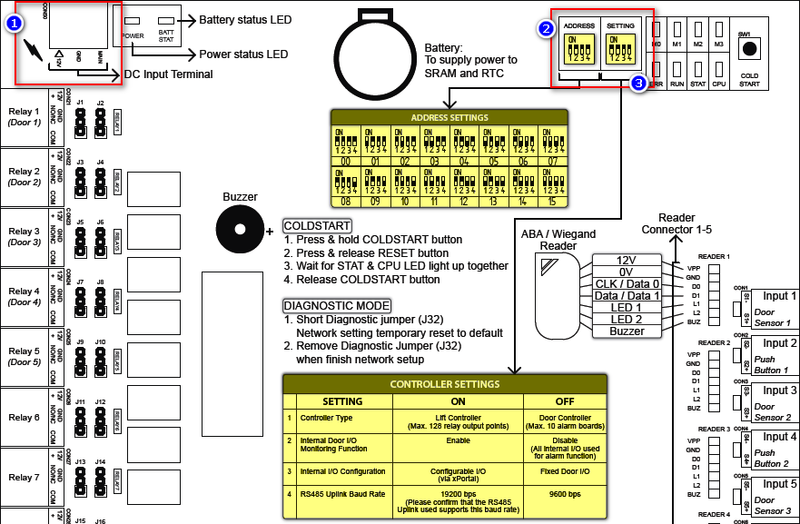 For high resolution image, please download the attached wiring diagram at the end of this article. Connect terminal +12V and GND to Power Supply (12VDC 3A). Then short the Main terminal to GND terminal. Find ADDRESS from the board. Toggle the DIP Switch to set the controller's address (Each address must be unique). Follow ADDRESS SETTINGS table (highlighted in yellow) to set the address. This address will be use later when user need to establish communication with software. Find SETTING from the board. Toggle the DIP Switch to set the controller's setting. Follow CONTROLLER SETTINGS table (highlighted in yellow) to set the setting. Controller will be operate according to the Setting configured. Eg: Lift/ Door controller. Connect terminal C+ and C- from the MCI to the terminal PC+ and PC- from the XP-SNET controller. Then short jumper 2 & 3 for RS485 port. Plug in the Network/ RJ45 cable to the RJ45 socket on the XP-SNET. Make sure the Yellow LED at network socket is blinking upon controller's power up. Configuring the Uplink is to be use when user need to establish communication with the software. Connect reader to the terminal CON32 / CON33. Connect the CON34 / CON35 from the extension board to the terminal CON35 / CON36 / CON37 at XP-SNET controller. Configuring the Downlink is to be use when user need to establish communication with the reader. After complete the configuration, please run the software and configure the software settings. If user just received controller after repair, please Coldstart the controller to reset the settings to default. Step 1: How to configure the XP-SNET controller's IP Address using Web Diagnostic? Step 2: How to configure the XP-SNET controller using RS485/ RS232 connection? Step 3: How to configure the XP-SNET controller using network connection? Summary: This article contains the wiring connection diagram for XP-SNET.